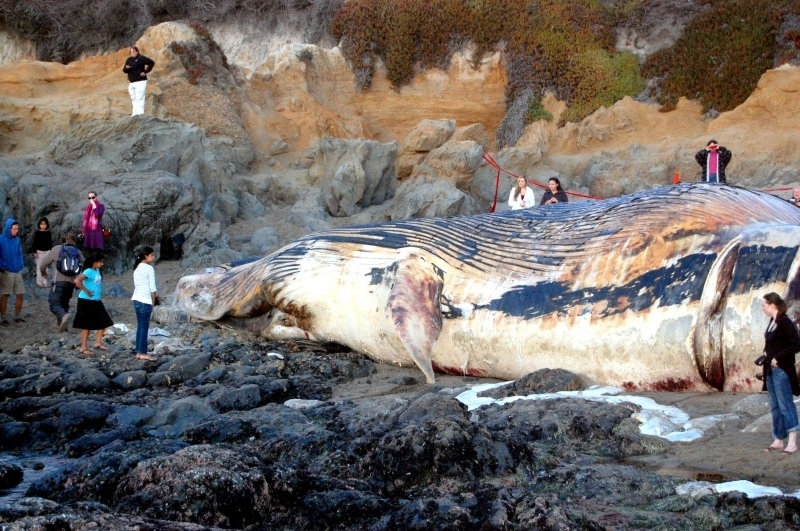 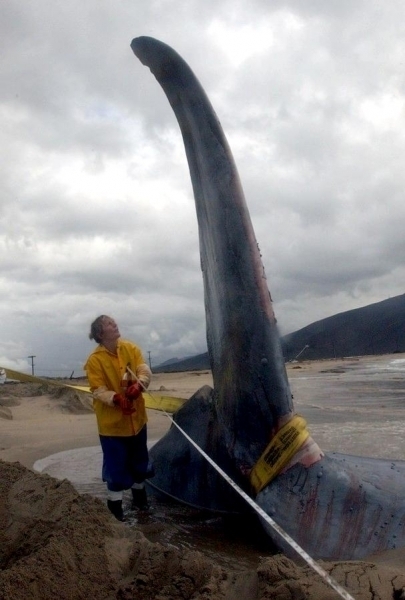 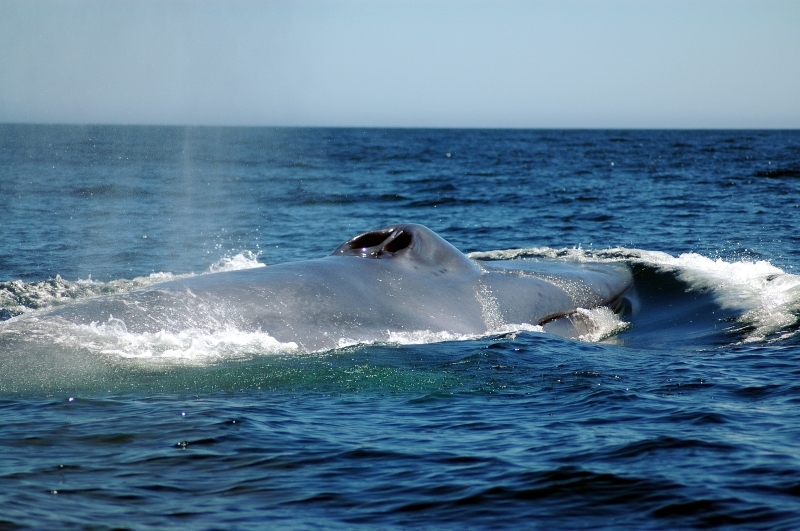 The Blue Whale is part of the mysticeti baleen whale suborder and is the largest animal alive on our planet. 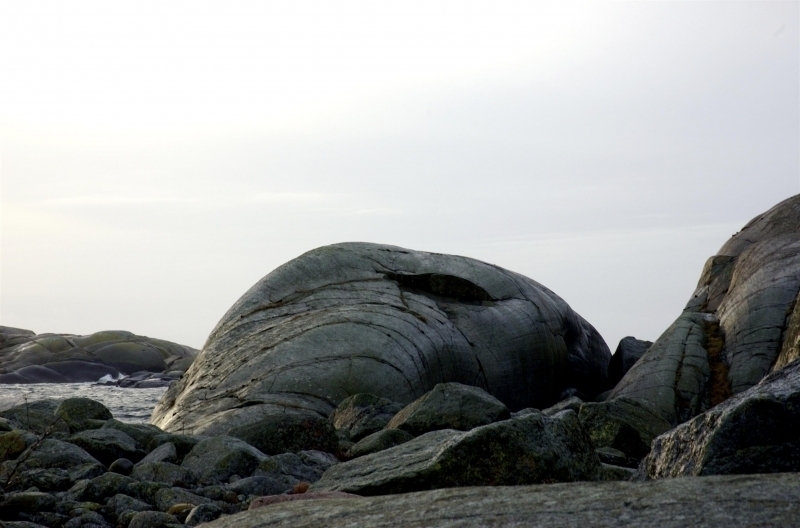 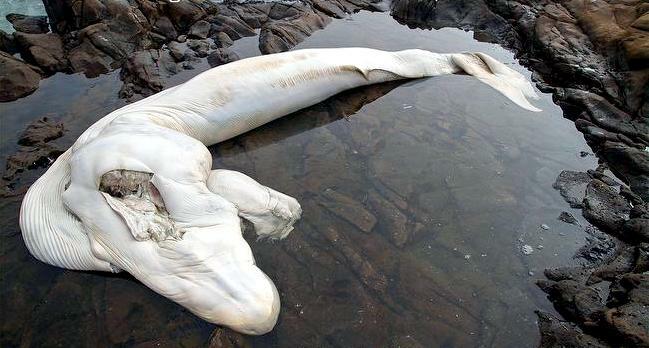 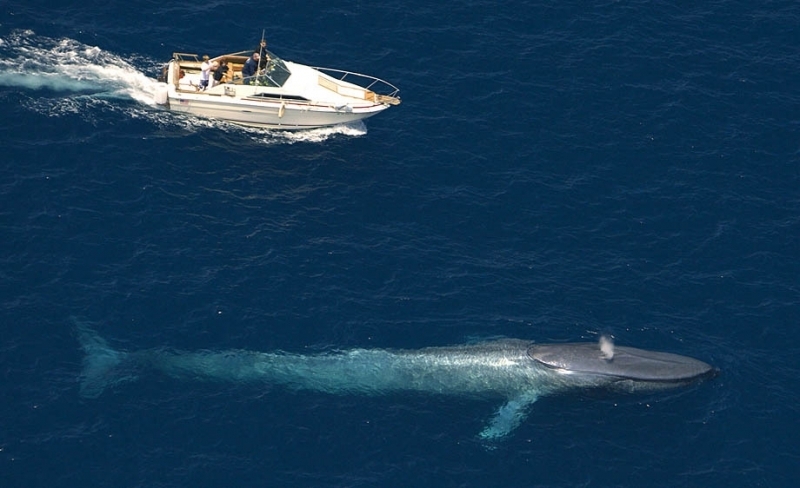 There are records of individuals over 100 feet (30.5 meters) long, but 70-90 feet (23-27 meters) is probably average. 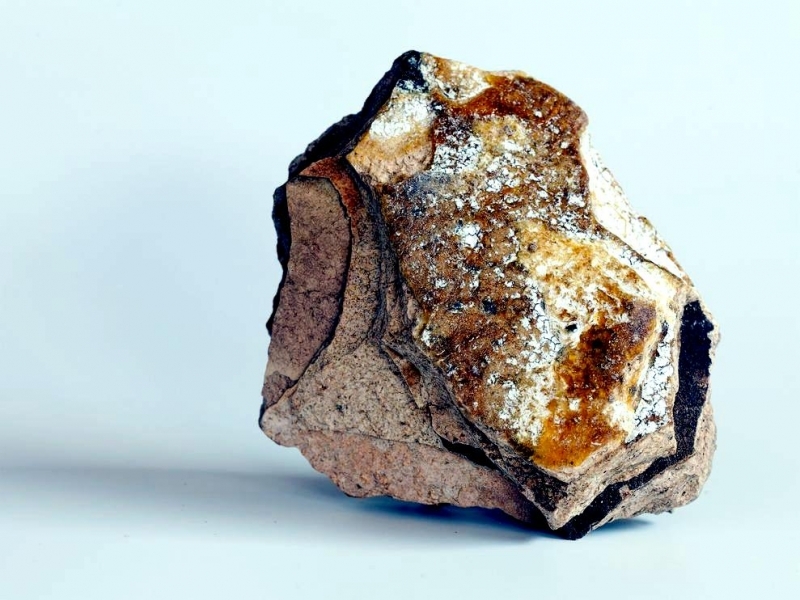 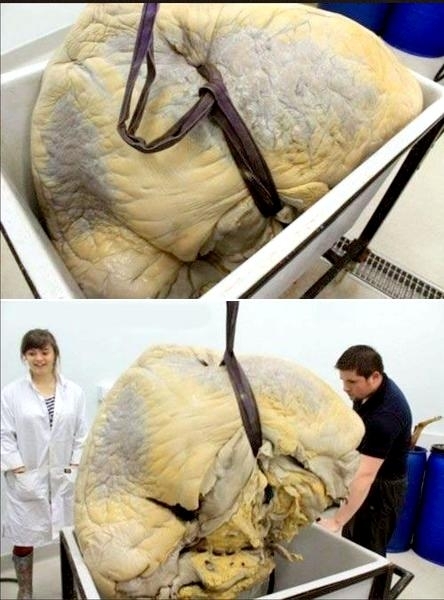 An average weight for an adult is 200,000 to 300,000 pounds (100-150 tons). 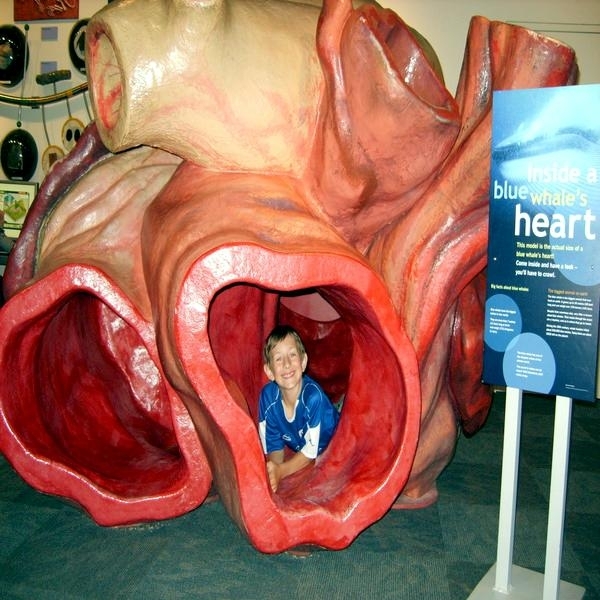 Its heart alone is as large as a small car. 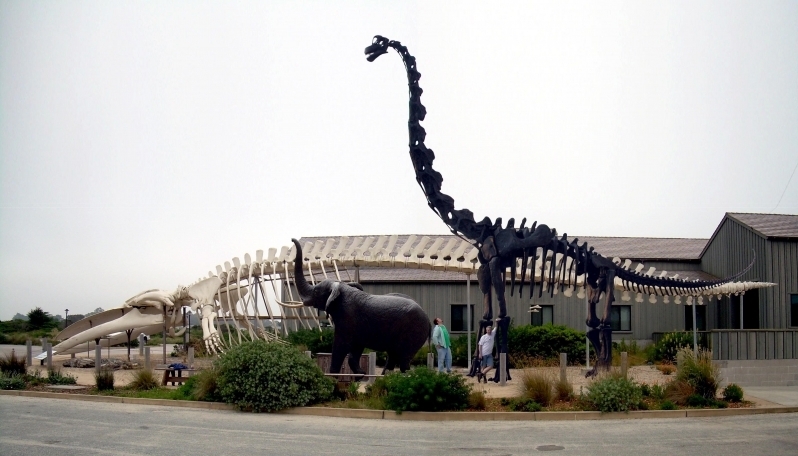 A good way to visualize their length is to remember that they are about as long as 3 school buses. 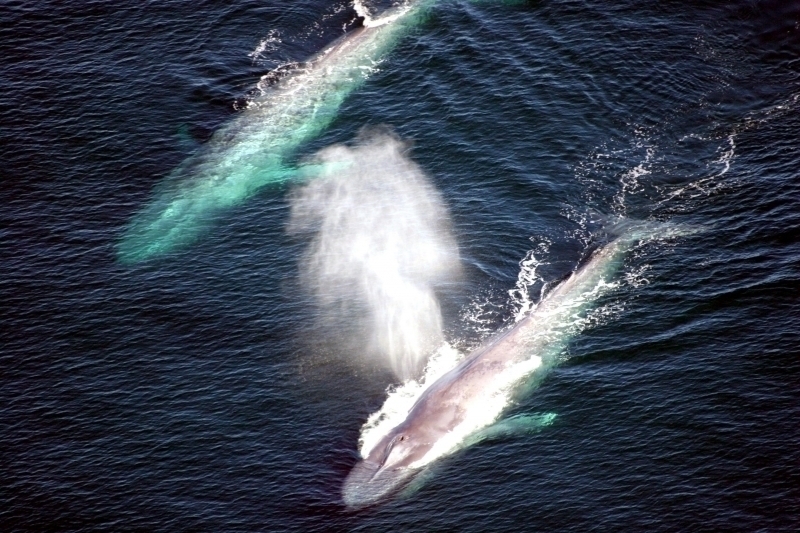 In addition to their size, they are also one of the loudest mammals in existence and can be heard many miles away. 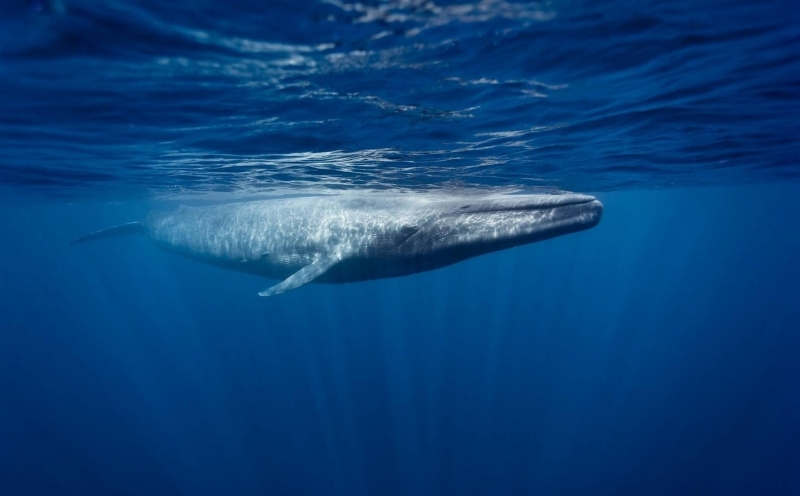 Scientists believe that Blue Whales use their sound not only for communication, but also for echolocation and are looking into the possibility of echolocation playing a role in helping these whales better navigate the world’s oceans. 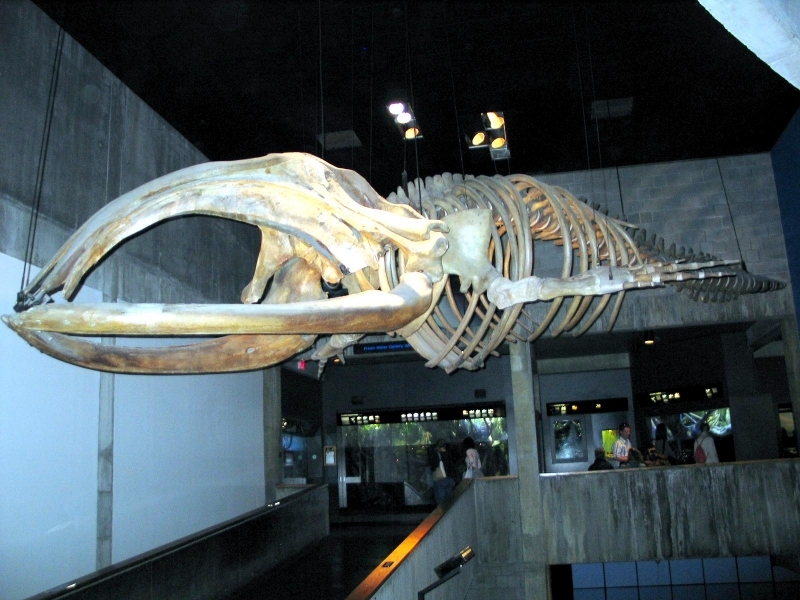 Surprisingly as compared to their massive size, these whales primarily eat krill which resemble small shrimp. 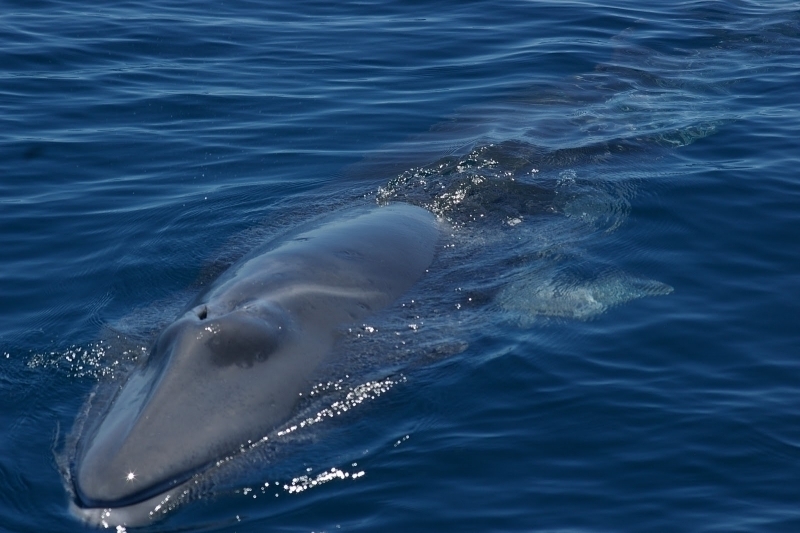 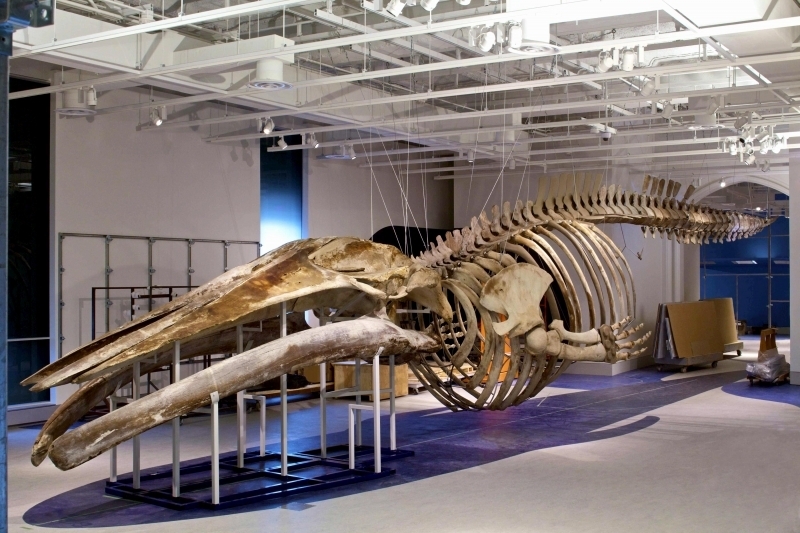 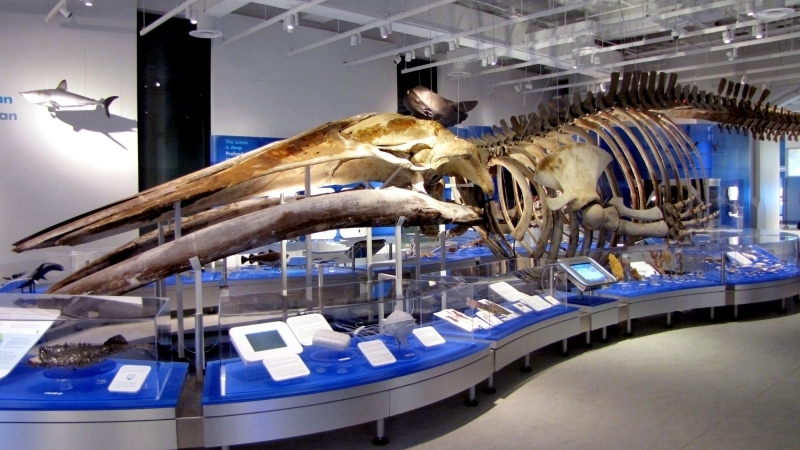 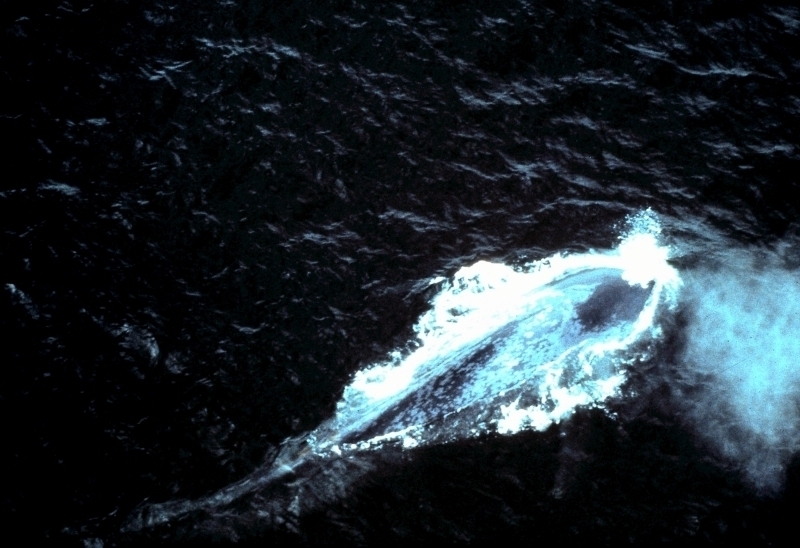 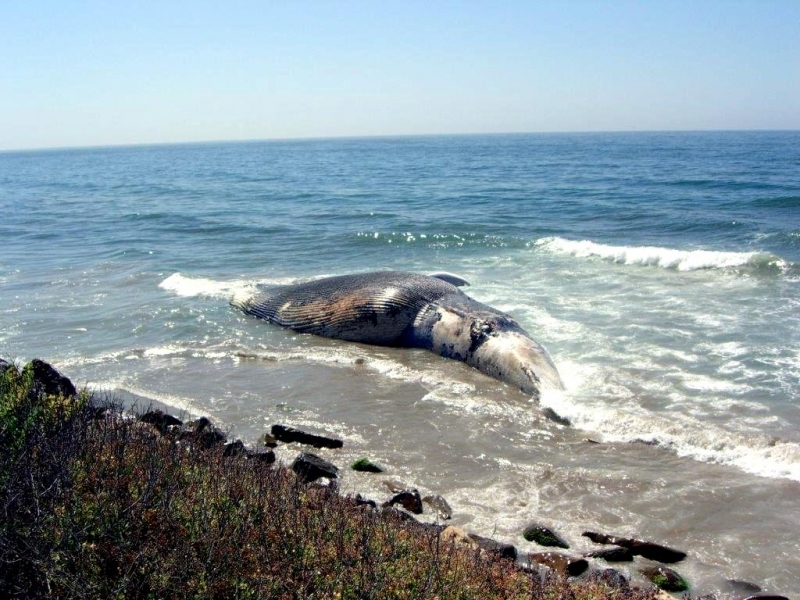 Blue Whales are an overall blue-gray color, mottled with light gray. 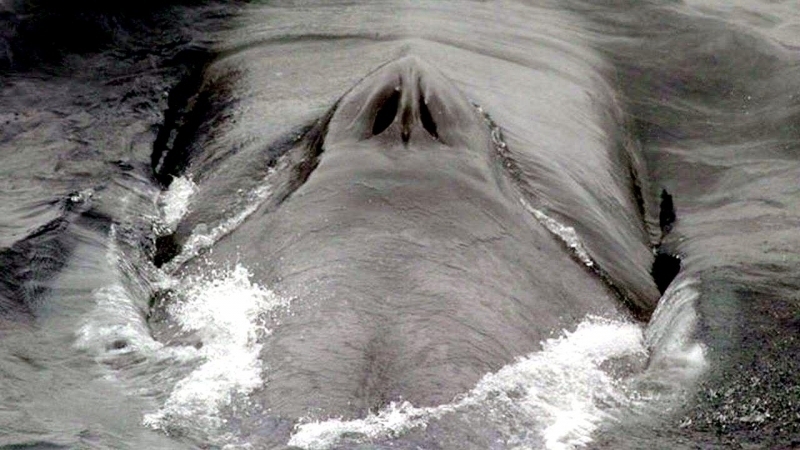 Cold water diatoms adhere to their skin and sometimes give their bellies a yellowish tinge, giving the Blue Whale its nickname of “sulfur bottom”. 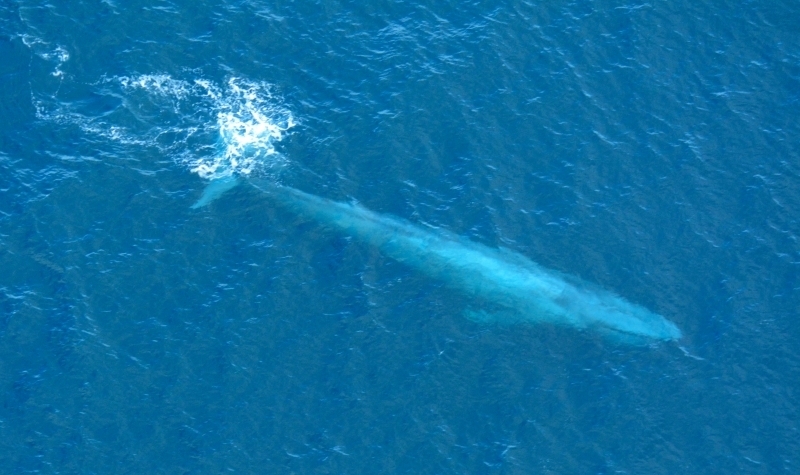 Blue Whales are long and streamlined. 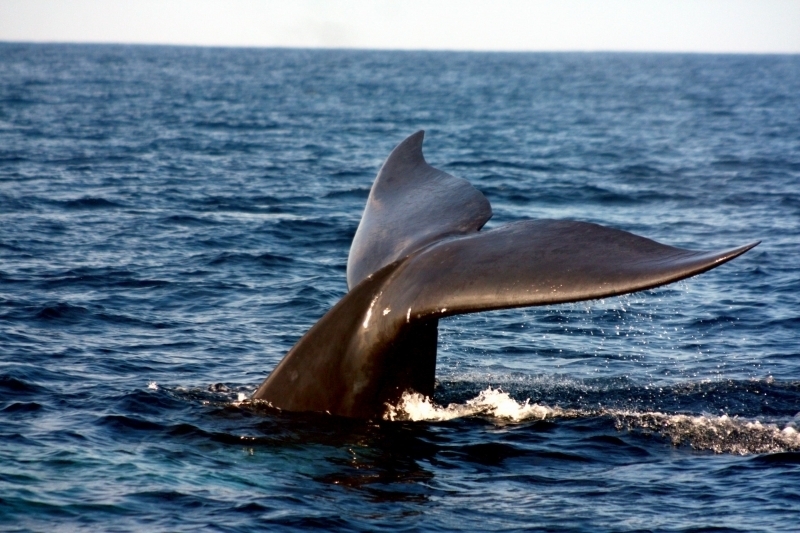 Their dorsal fins are extremely small and their pectoral flippers are long and thin. 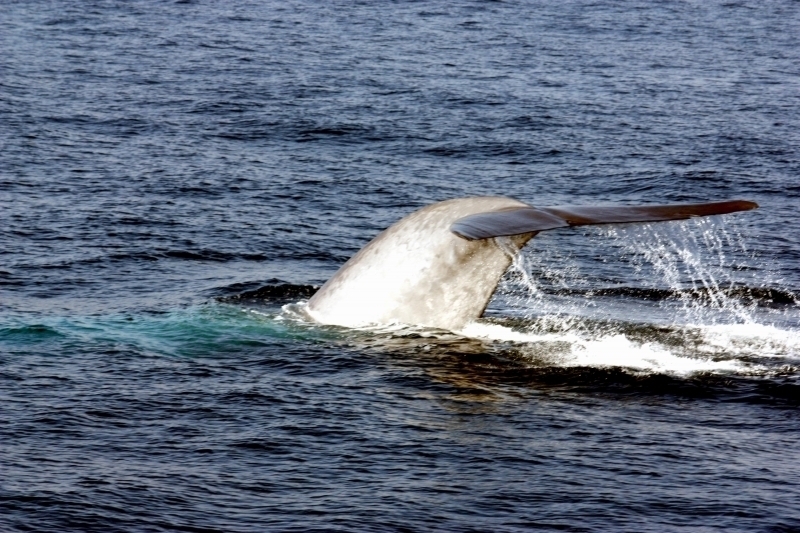 These marine mammals travel an average of 3–12 mph, but can reach speeds of over 25 mph when they feel threatened or agitated. 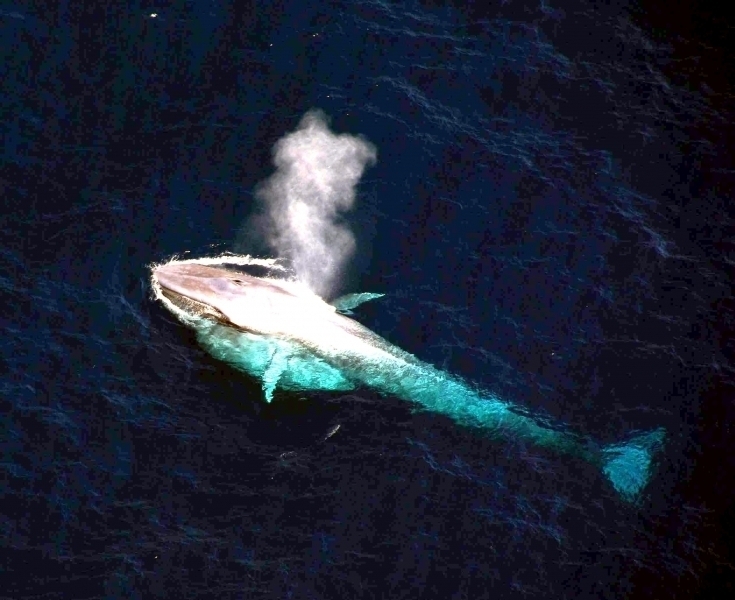 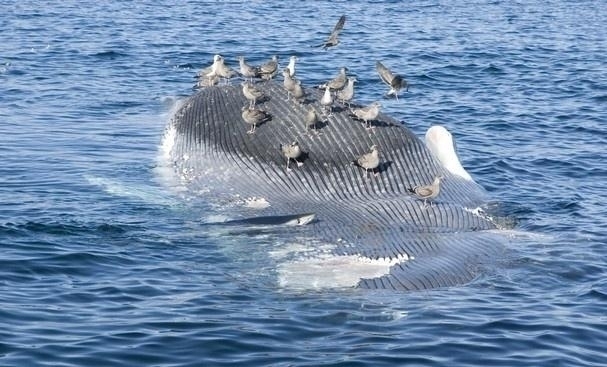 Other than humans, Blue Whales are rarely attacked by other animals. 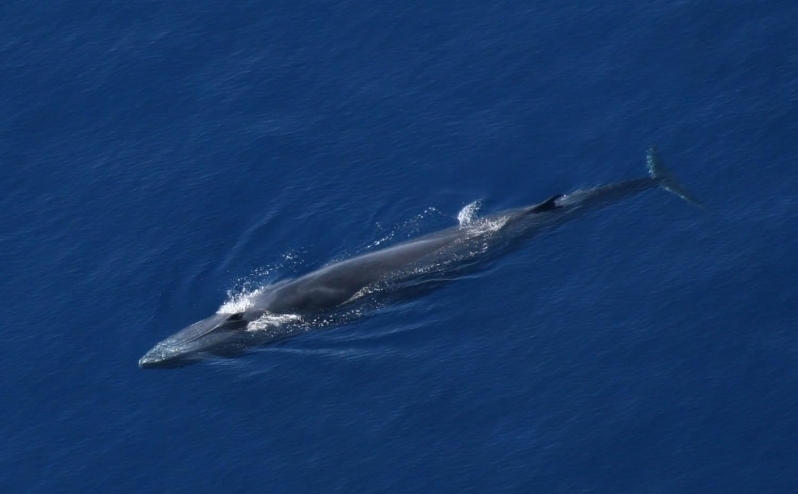 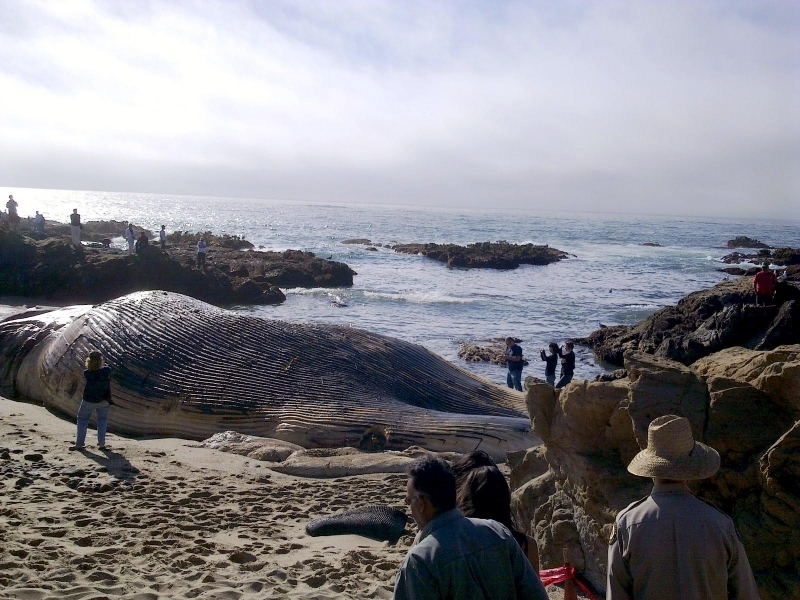 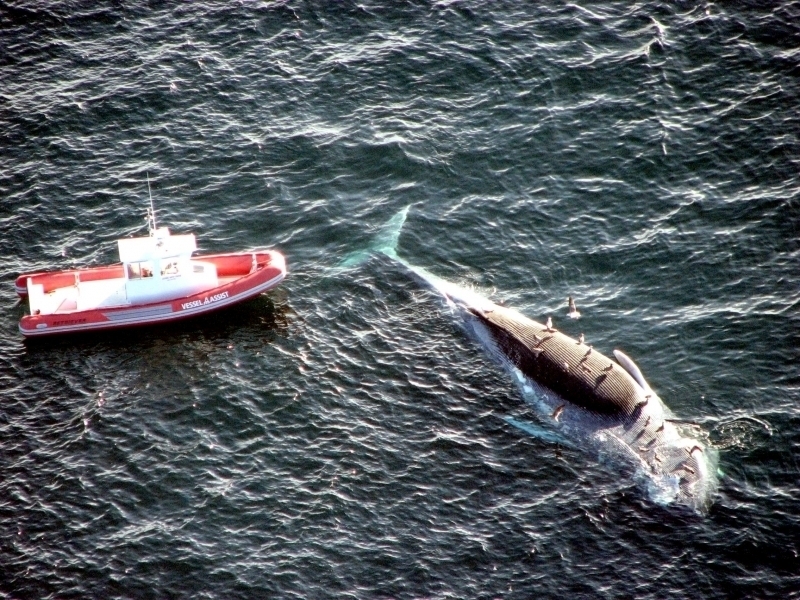 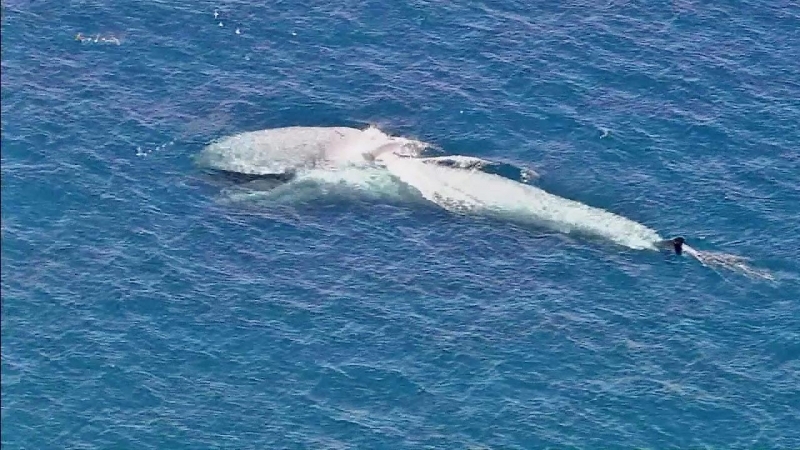 On rare occasions, Blue Whale calves may come under attack by large sharks or Killer Whales which have been filmed bringing down an adult in the Monterey Bay region. 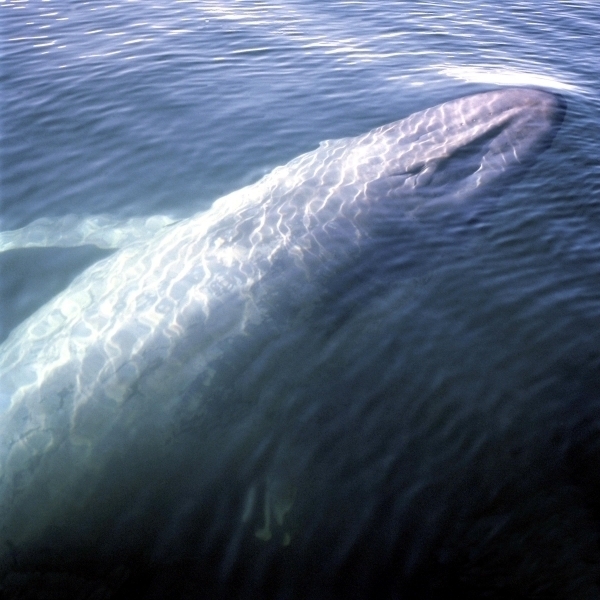 They primarily eat krill although other small ocean creatures such as copepods can be ingested as well. 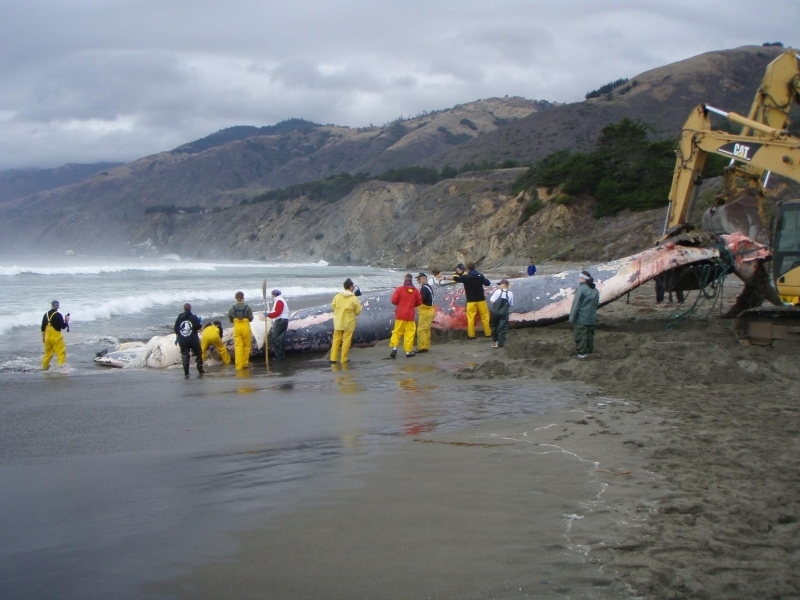 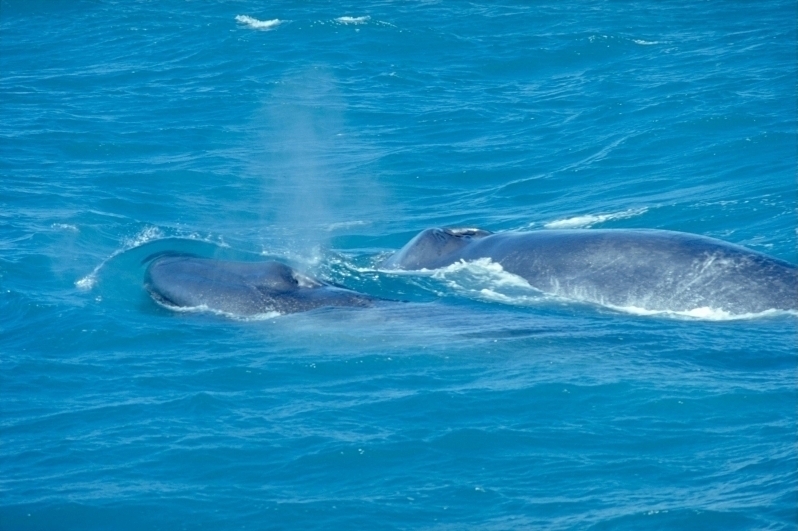 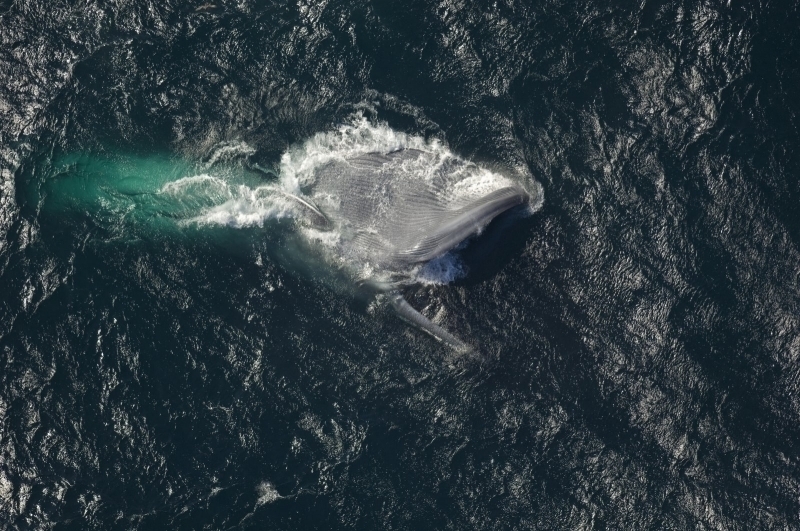 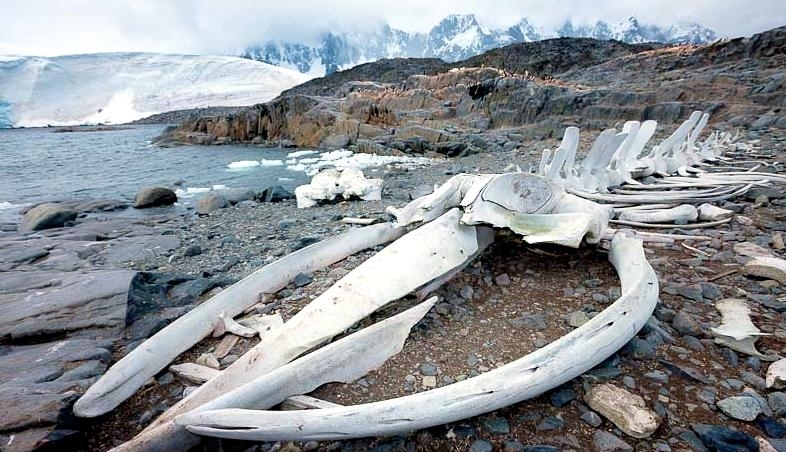 Blue Whales are almost always found in area’s with high concentrations of krill. 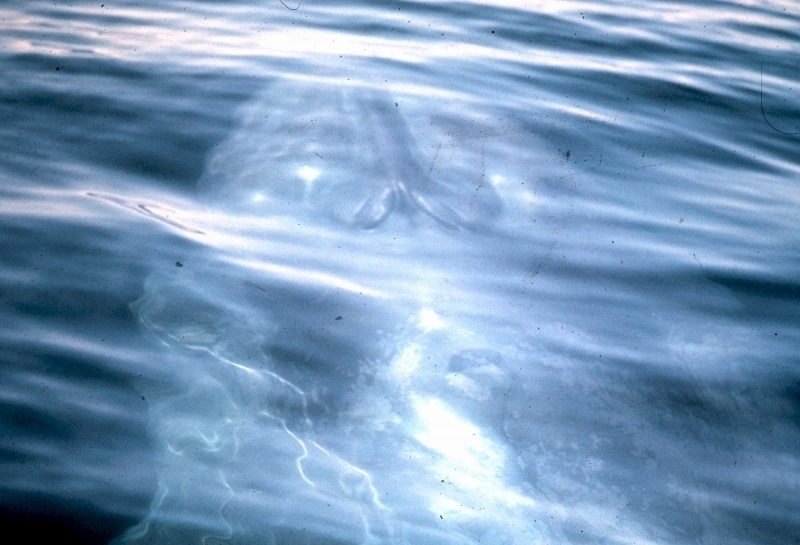 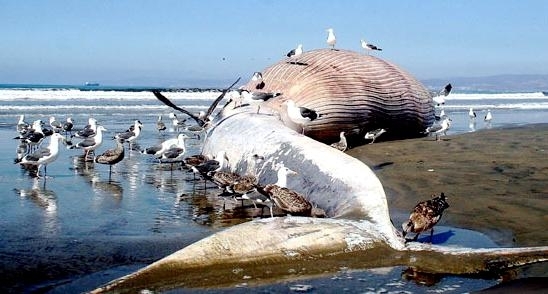 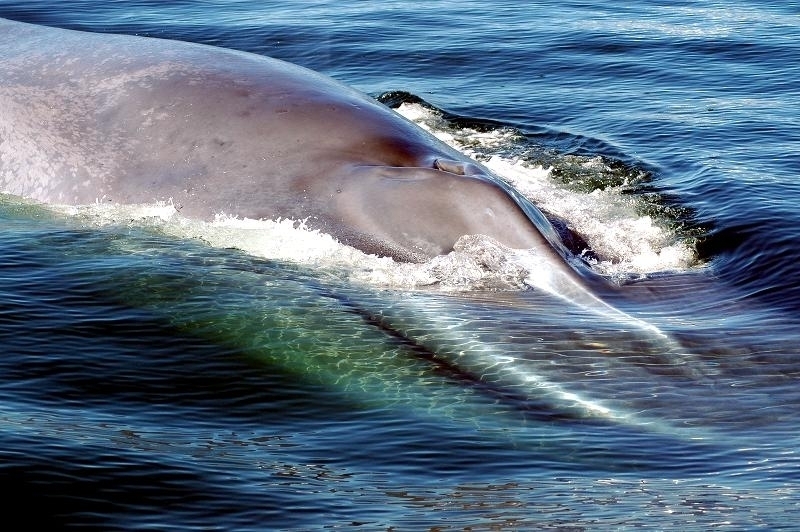 The method Blue Whales use to capture & consume their prey is known as “filter feeding”. 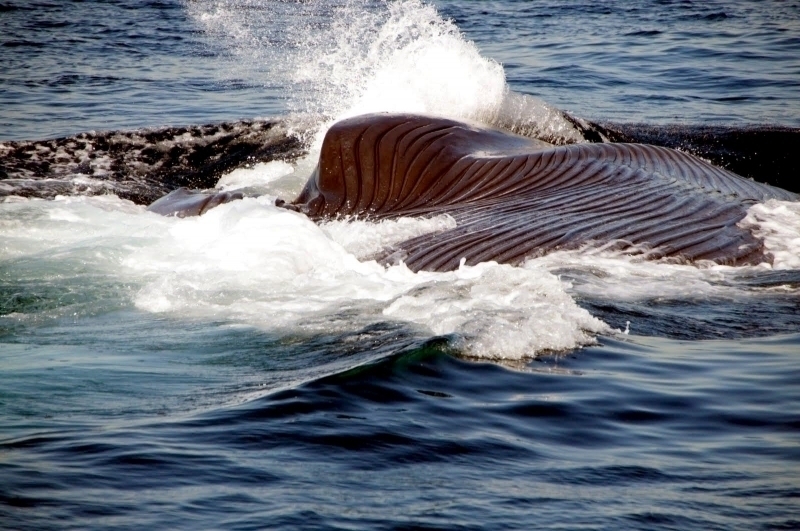 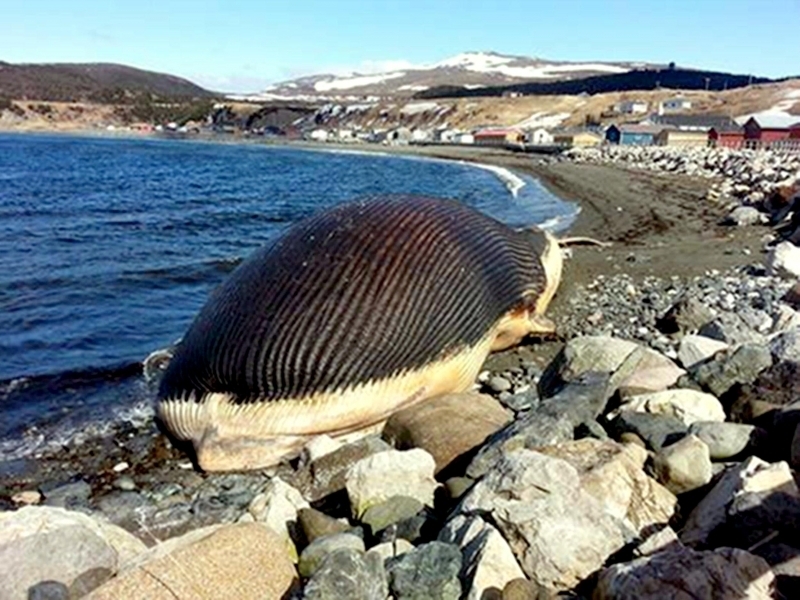 These whales hunt for their food by opening its mouth, lunging at the krill and ingesting large amounts of krill. 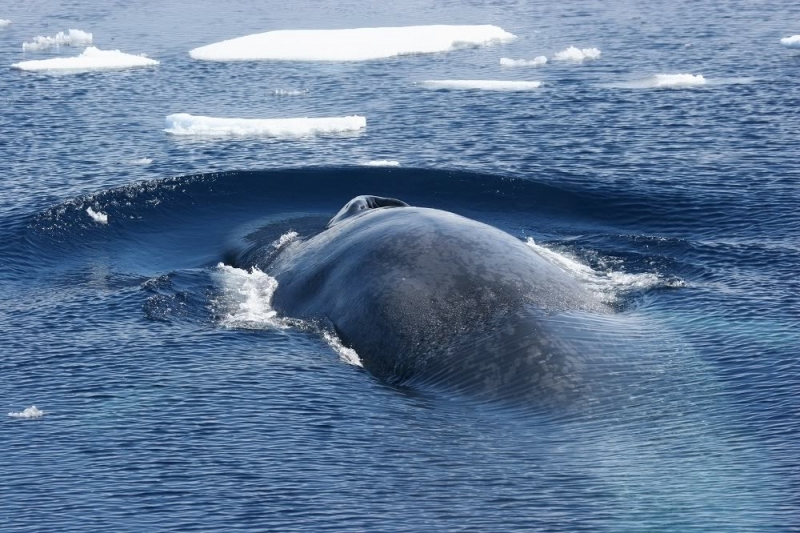 As they ingest the water, the small krill get stuck in the whale’s baleen plates. 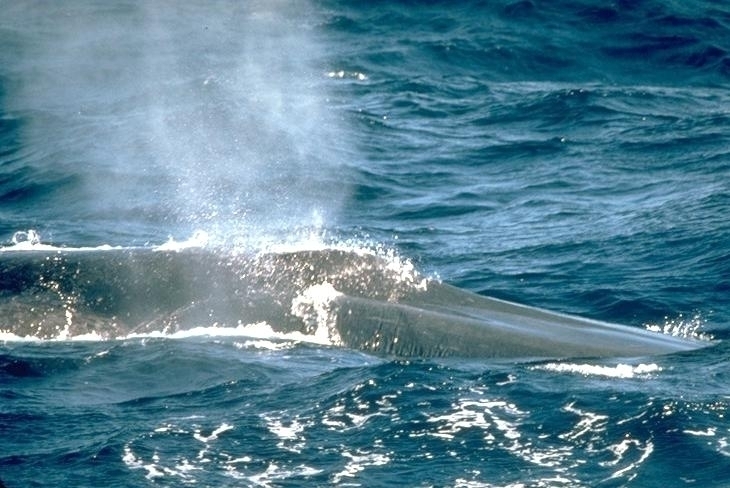 Blue Whales are rorqual whales, a family of baleen whales with pleated throat grooves that expand when the animal takes in water while feeding. 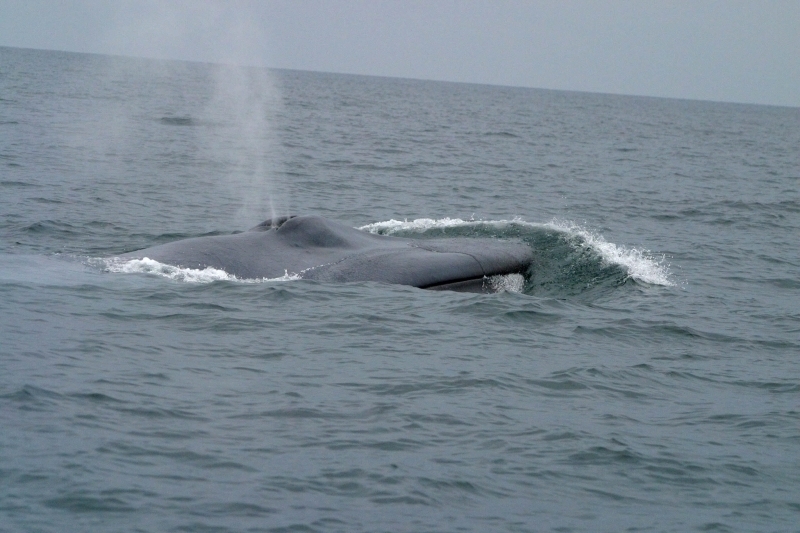 In Blue Whales, 55-68 throat grooves extend from the throat to the navel. 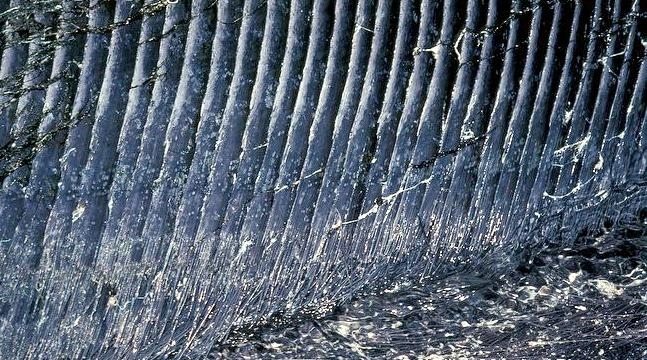 Blue Whale baleen is black with over 800 plates. 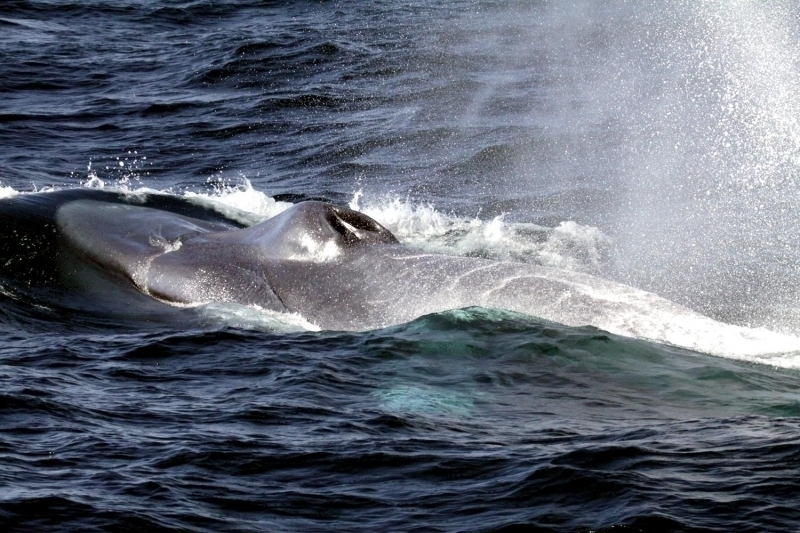 The Blue Whale ejects the water by pushing it out with its tongue through the baleen plates and swallows the trapped krill. 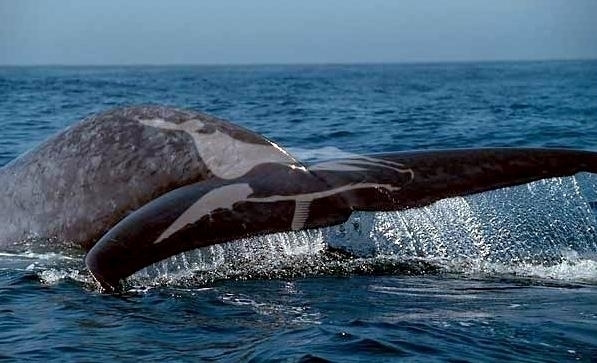 Compared to their length their bodies are generally slim & streamlined for speed and long distance travel allowing them to swim up to 25 mph or more (average speed is closer to 5-10 mph). 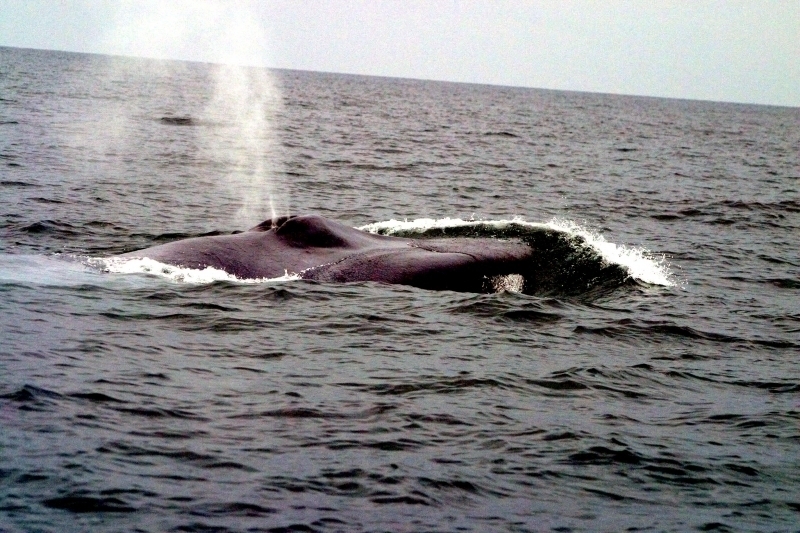 The Blue Whale also has a very small triangular dorsal fin as compared to the larger dorsal fin of many other whales and short flippers which only measure about 12% of the whales length. 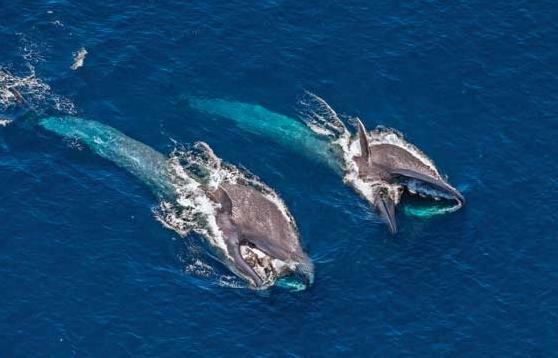 These whales will migrate towards colder polar waters during feeding season, warmer tropical waters during mating season and can travel thousands of miles during their migration. 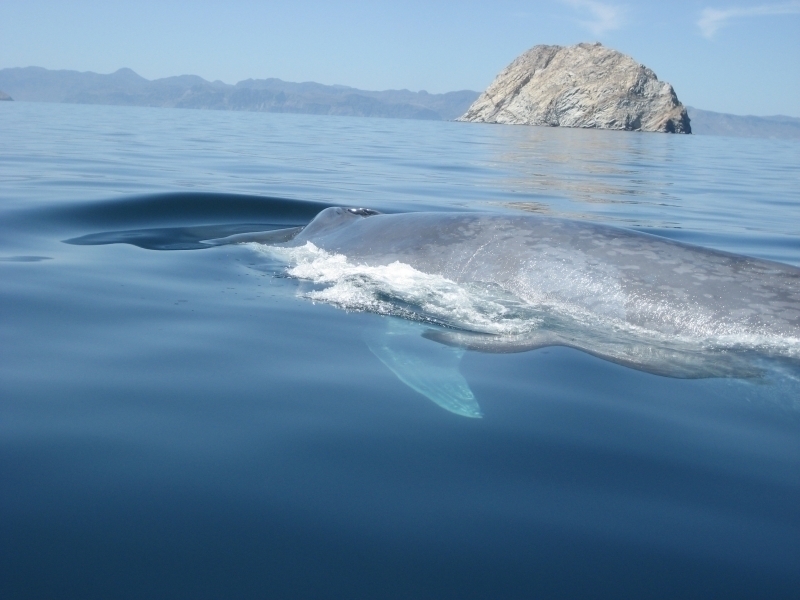 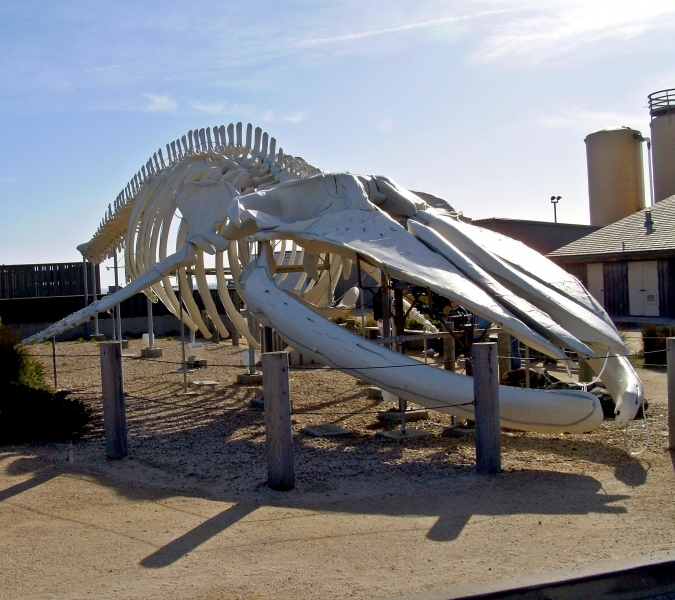 While they migrate, Blue Whales will forgo eating food and live primarily off of body fat and stored calories. 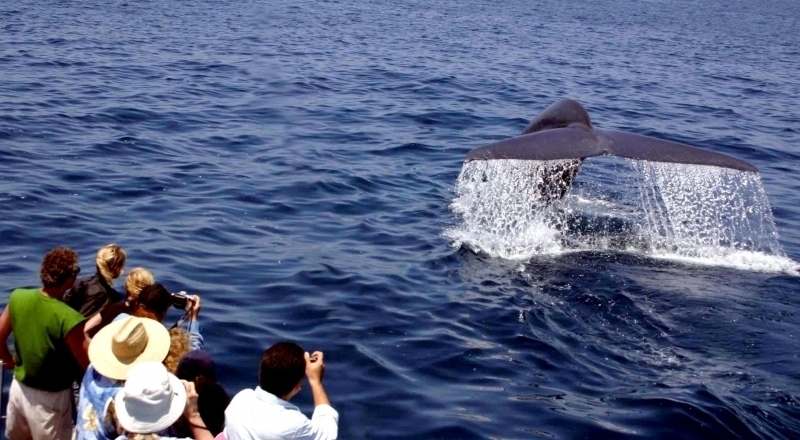 Migration trips can last for up to 4 months depending on where they are traveling. 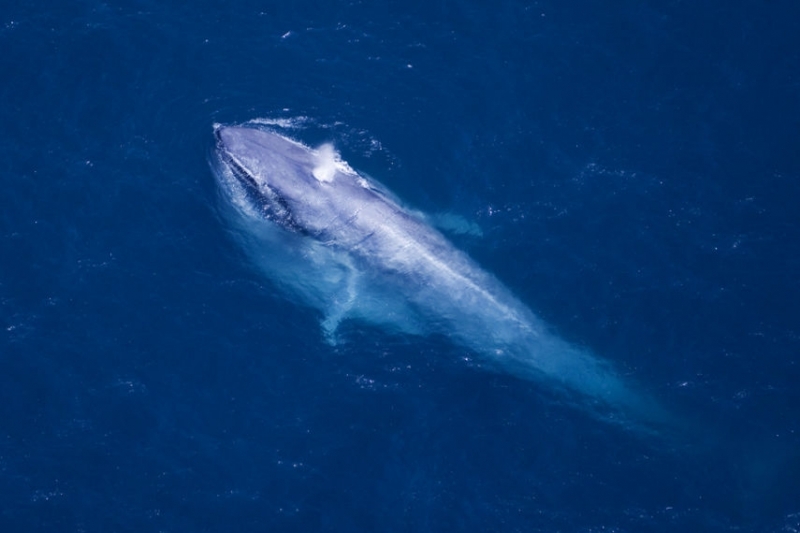 Older, pregnant & sexually mature Blue Whales typically travel first and furthest during migration due to experience and excess body fat which allows them to deal with colder waters more effectively than younger whales. 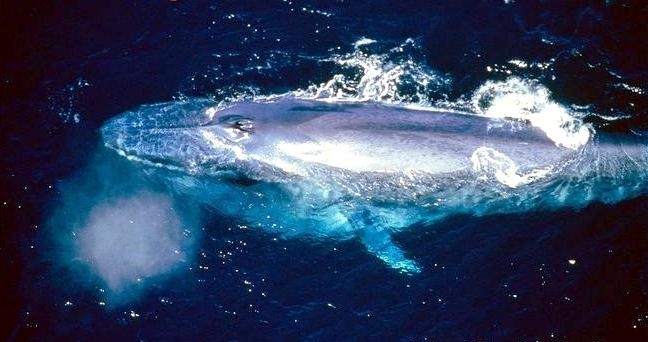 Blue Whales usually mature around 8-10 years of age. 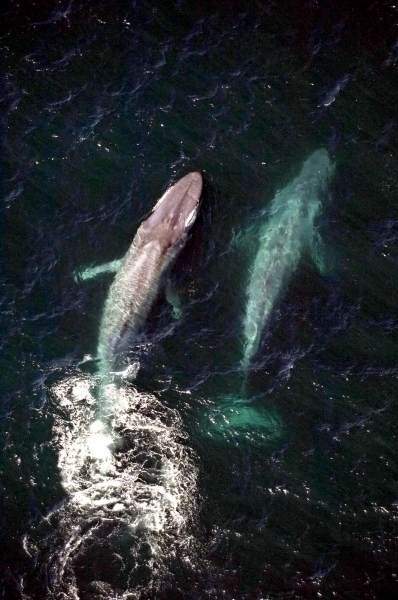 When they reach adult hood the females grow to be larger on average than their male counterparts. 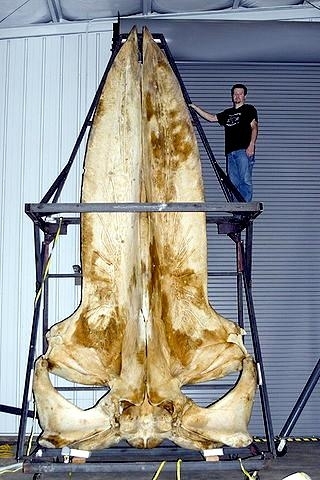 Little is known about how they breed. 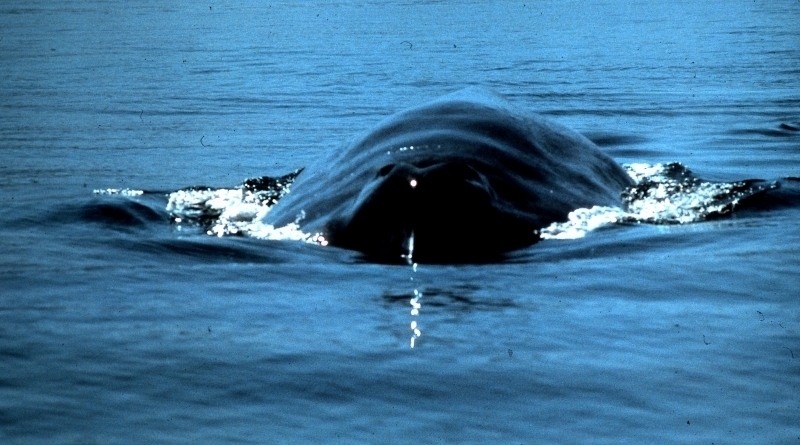 Females breed on average every 2-3 years. 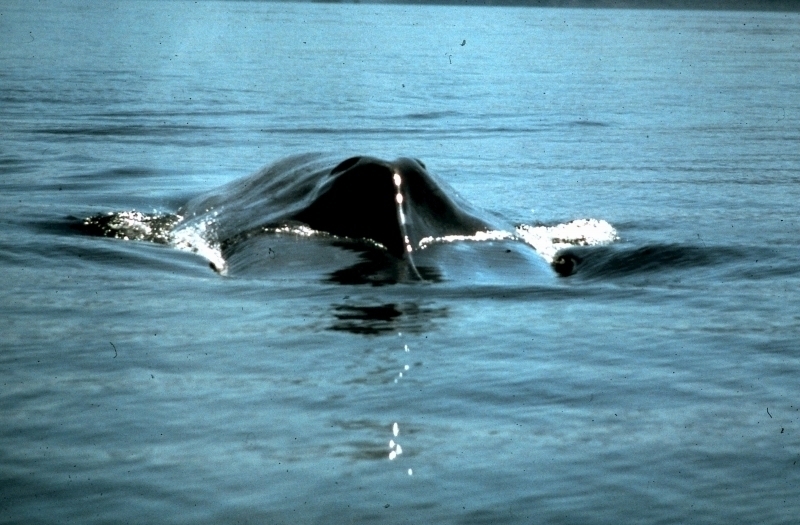 Birth usually takes place 10–12 months after mating. 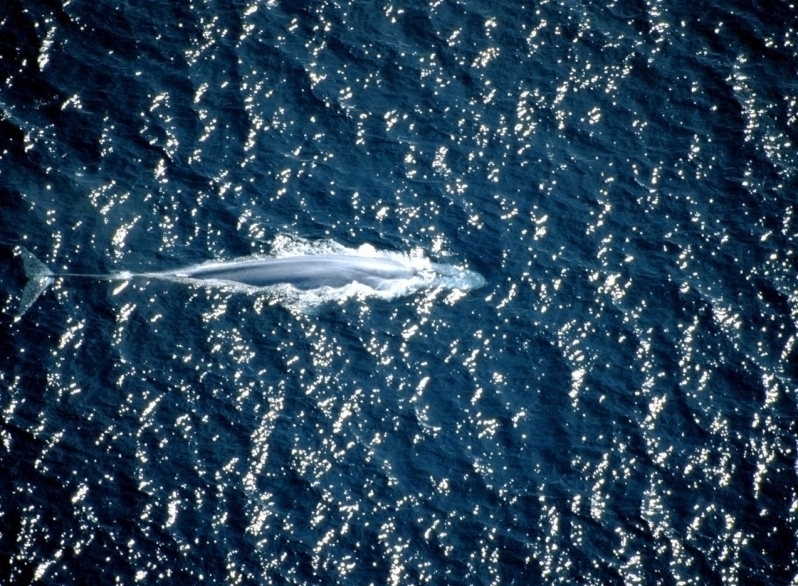 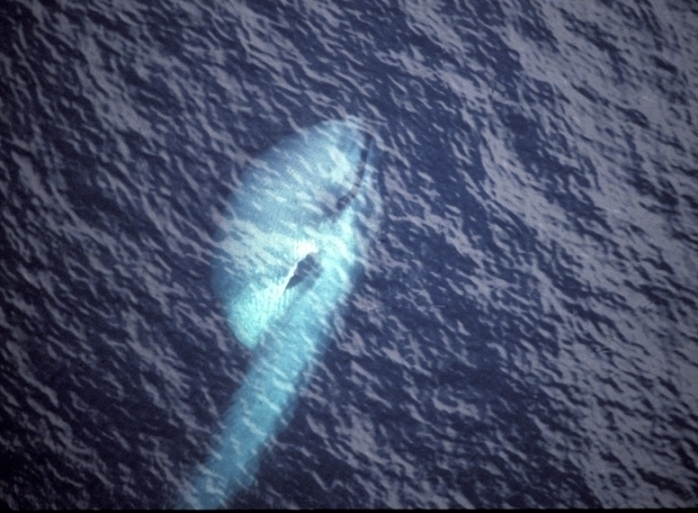 Blue Whales are solitary animals often traveling alone or in small groups. 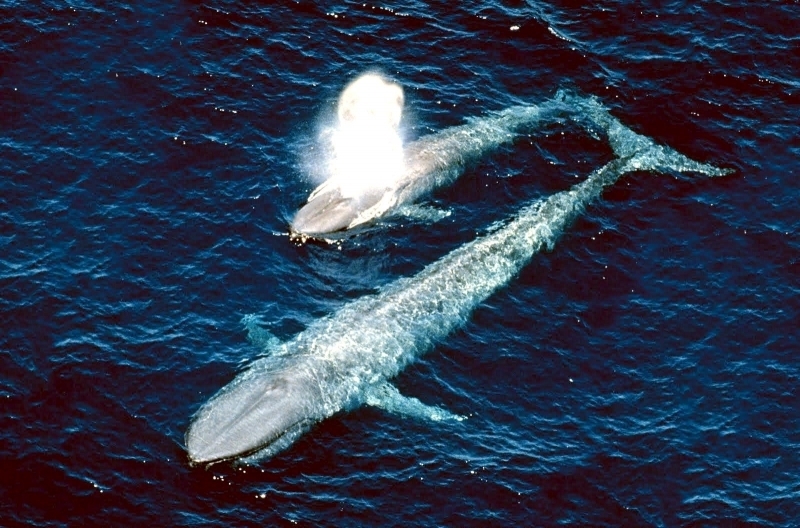 They communicate to one another by using loud low-pitched sounds which can be heard many miles away. 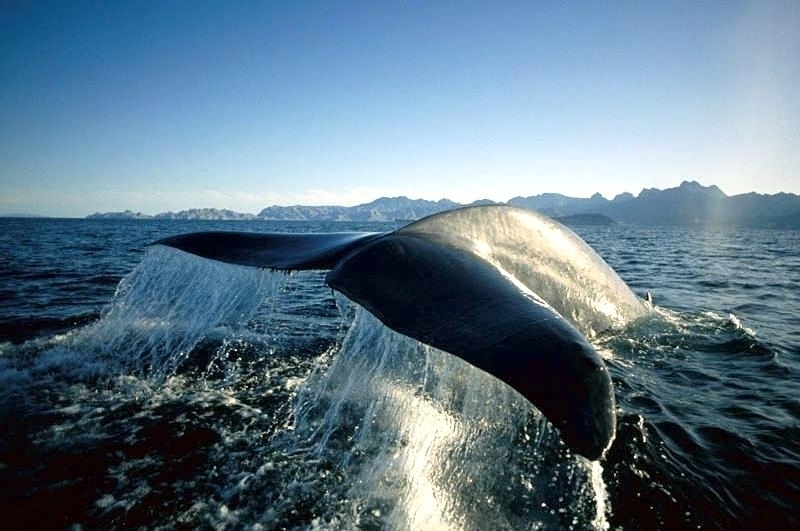 The Blue Whale is the loudest animal on Earth. 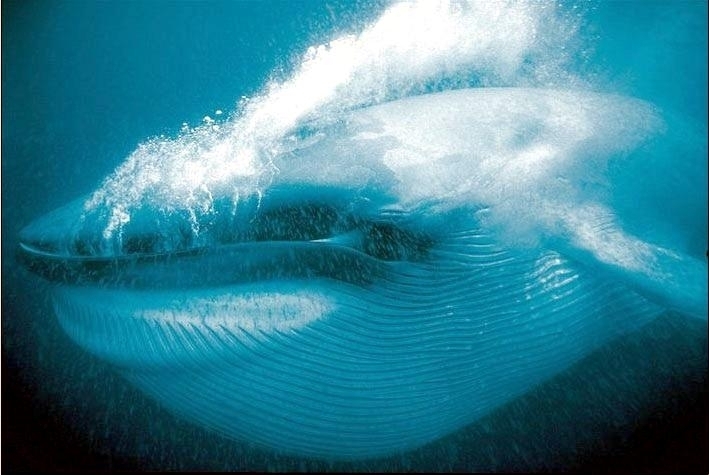 They emit very loud, highly structured, repetitive low-frequency rumbling sounds that can travel for many miles underwater. 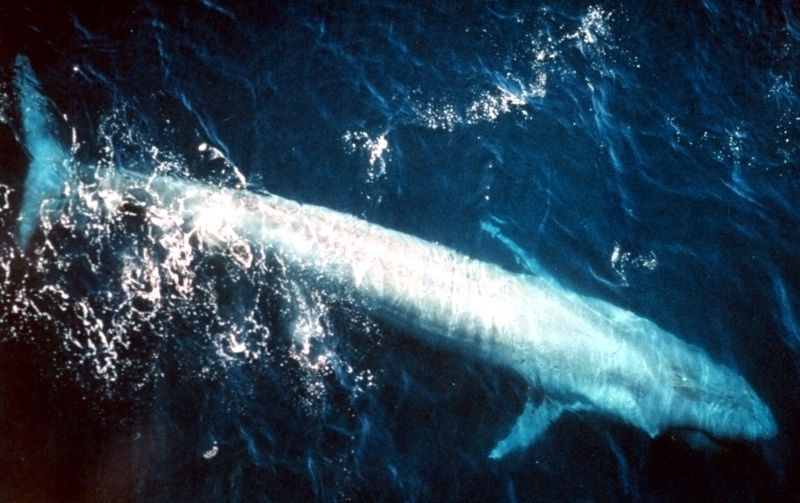 These songs may be used for communicating with other Blue Whales, especially in order to attract and find mates. 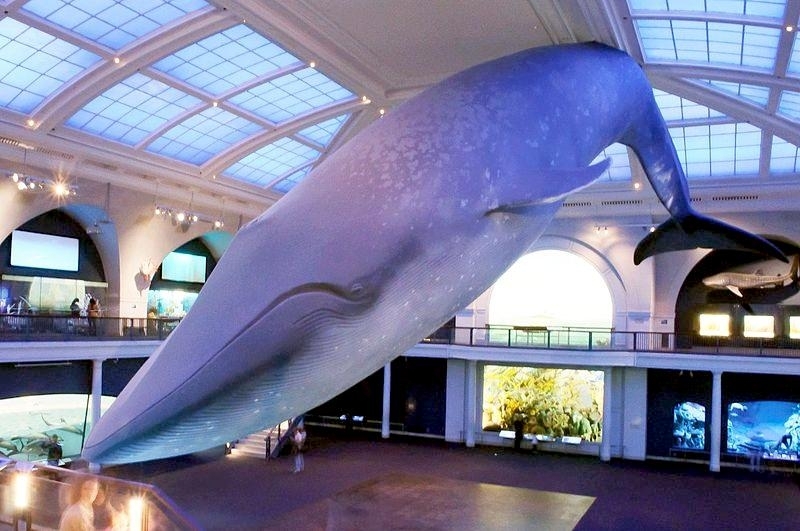 The sound of the Blue Whale reaches levels up to 188 decibels. 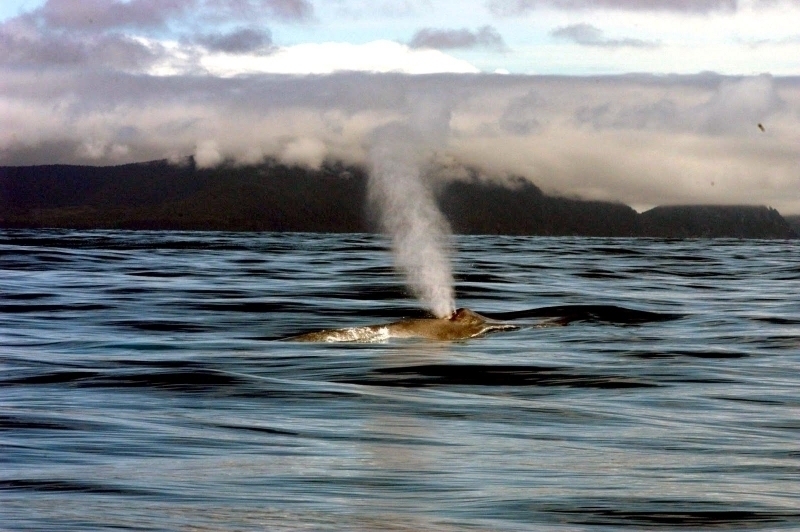 This extraordinarily loud whistle can be heard for hundreds of miles underwater. 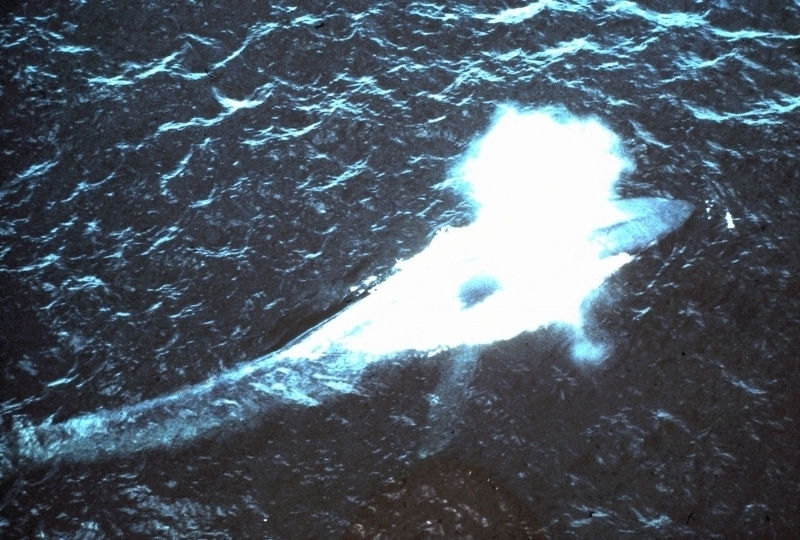 Theoretical calculations from the 1970’s, predicted that the loudest Blue Whale sounds might be transmitted across an entire ocean. 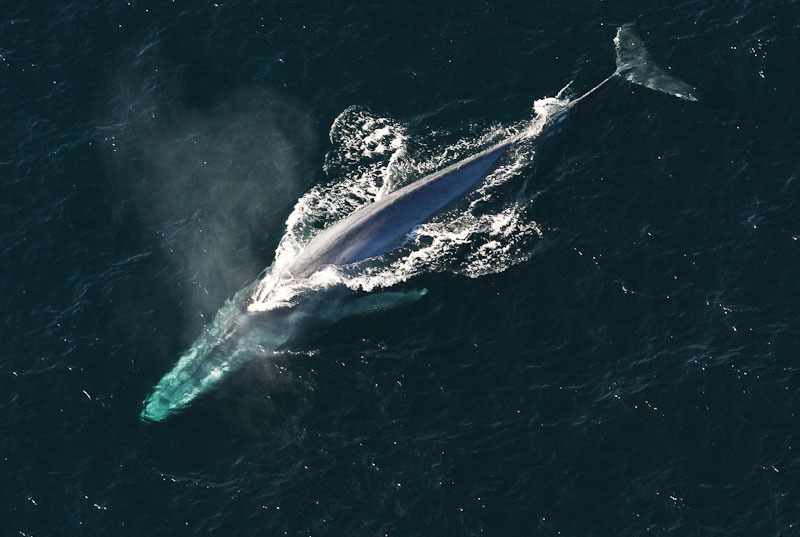 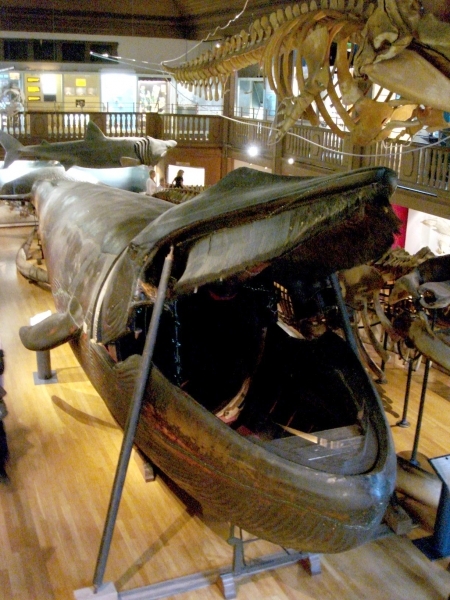 The Blue Whale vocalization is much louder than a jet plane, which reaches only 140 decibels. 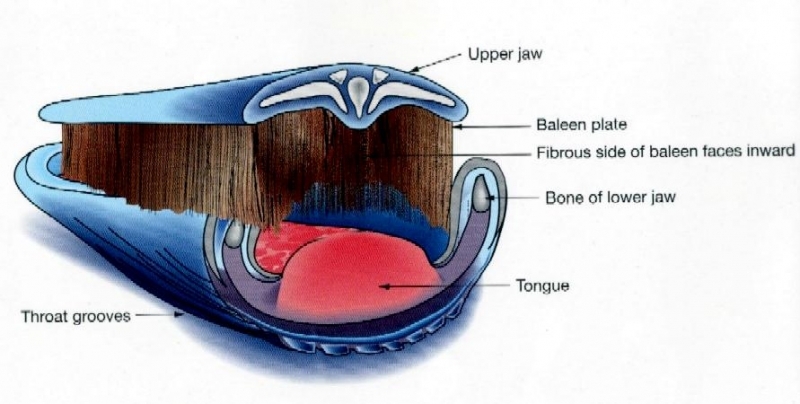 Human shouting is 70 decibels; sounds over 120 decibels are painful to human ears. 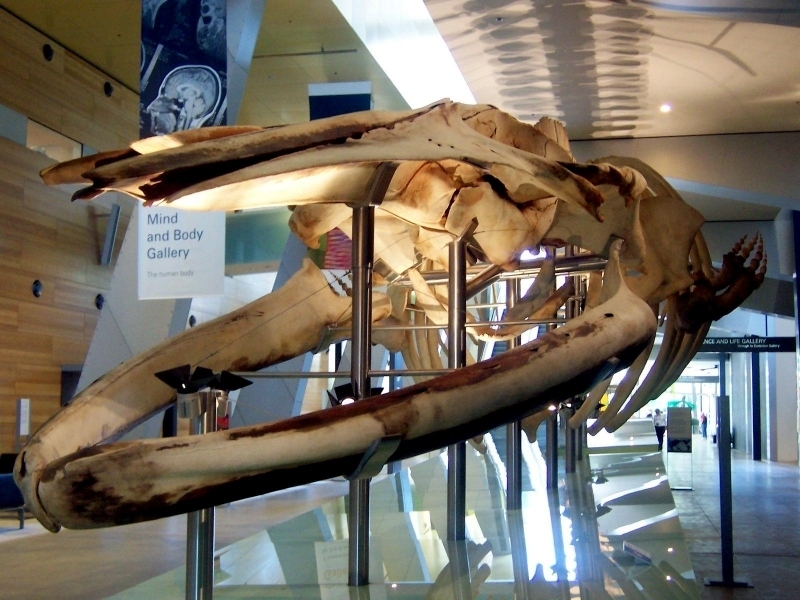 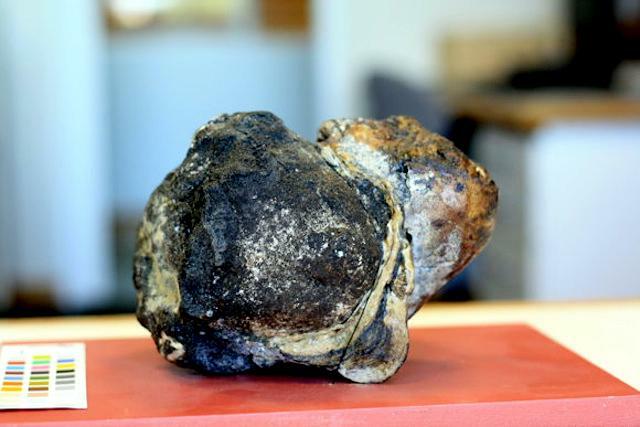 The source of all cetacean sound production is unknown, but the larynx is the likely source. 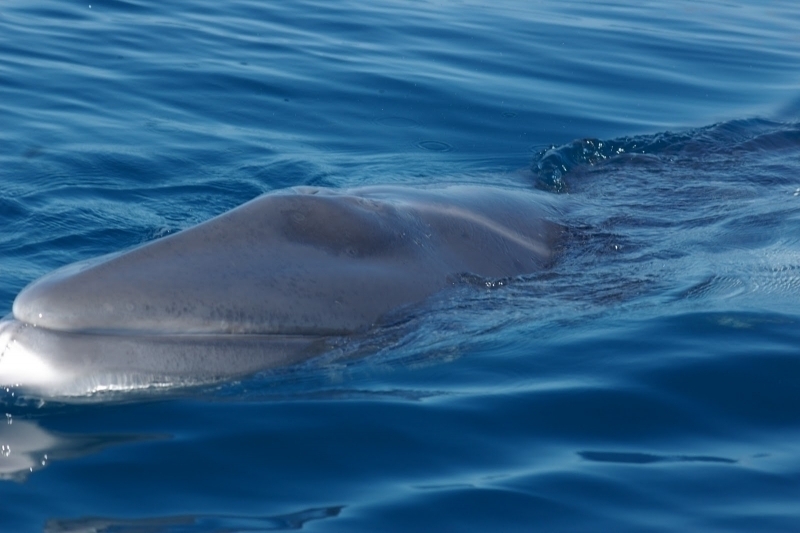 Unlike humans, cetaceans have no vocal cords in their larynx. 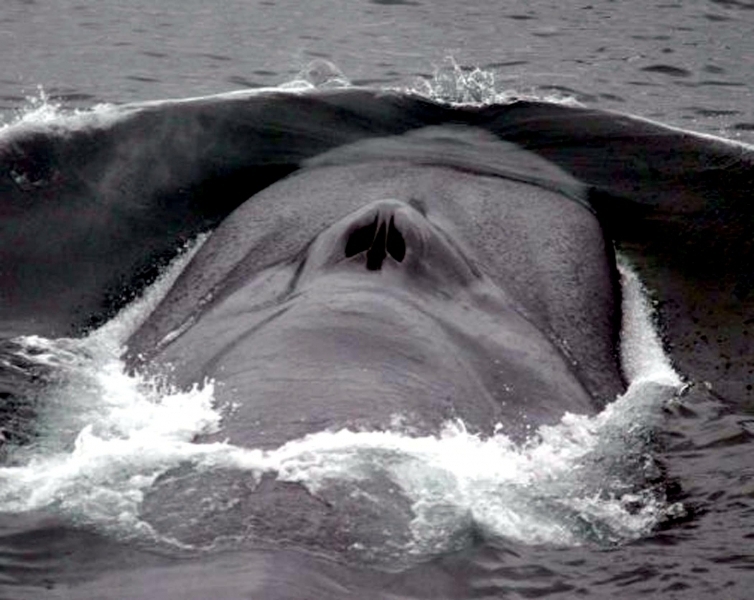 Whales, dolphins & porpoises produce sounds by moving air through a tubed extension of the larynx to the nasal plugs located near the nasal sacs near the blowhole. 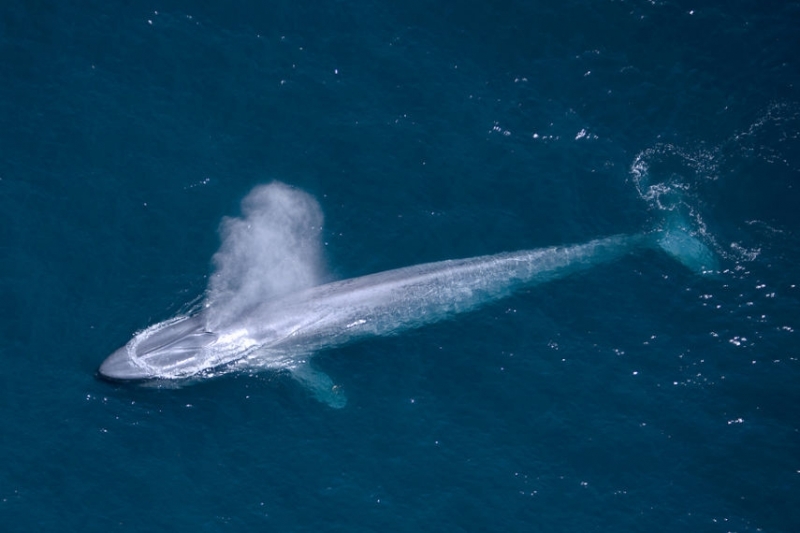 Although they prefer being solitary, Blue Whales can be found traveling in larger pods during periods of feeding & migration. 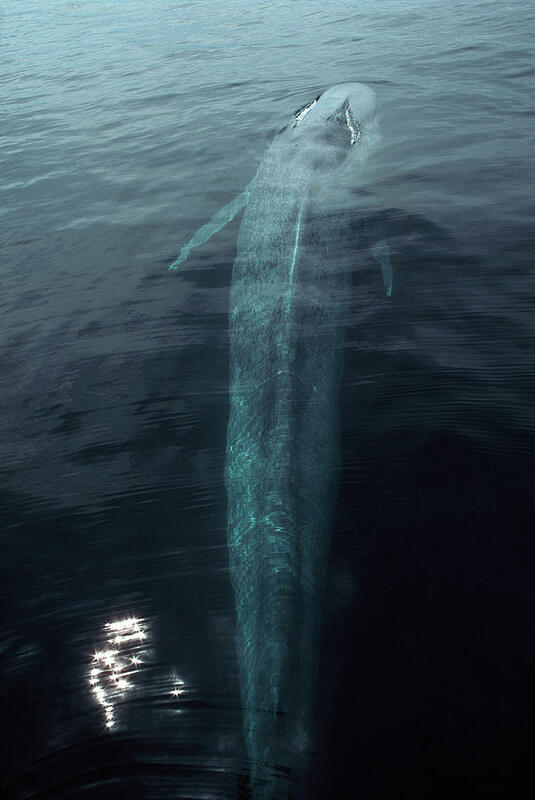 Blue Whales can be found swimming throughout the world’s major oceans.